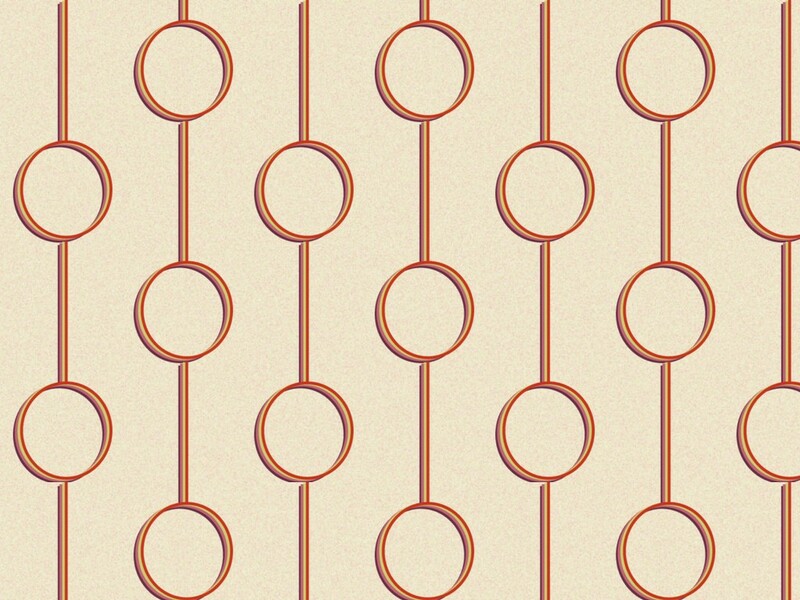 Once more we are again at the junction between the 1950’s and the 1960’s with a wallpaper that uses a lot of the ideas of that mid-century period. The actual design is a simple one, simple but effective use of a repeating motif. The motif is very mid-century, too, just a simple swirl around a shape and this was very much the sort of mass produced wall covering that was appearing at that time. This was not high fashion but just the ordinary wallpaper that people saw in the shops and brought for their living room. 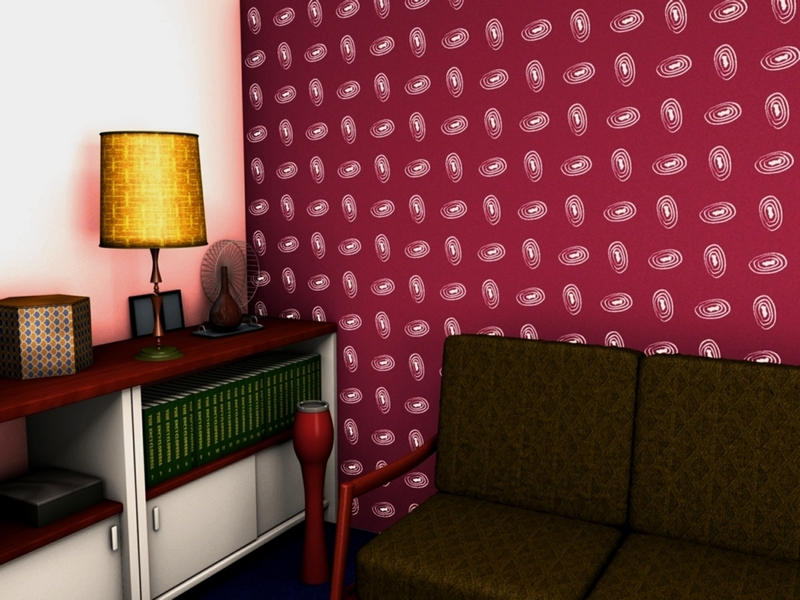 I borrowed the 1960s living room for the wallpaper since I have used the other set that I usually use for wall covering a lot recently. Exploding atoms! 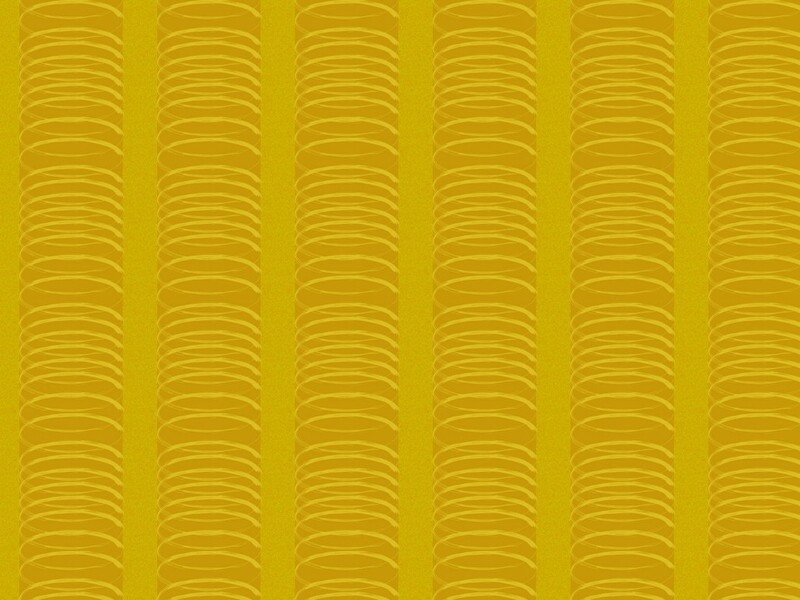 This theme is used to produce a wallpaper that would have been perfect for the later half of the 1950s and into the next decade. 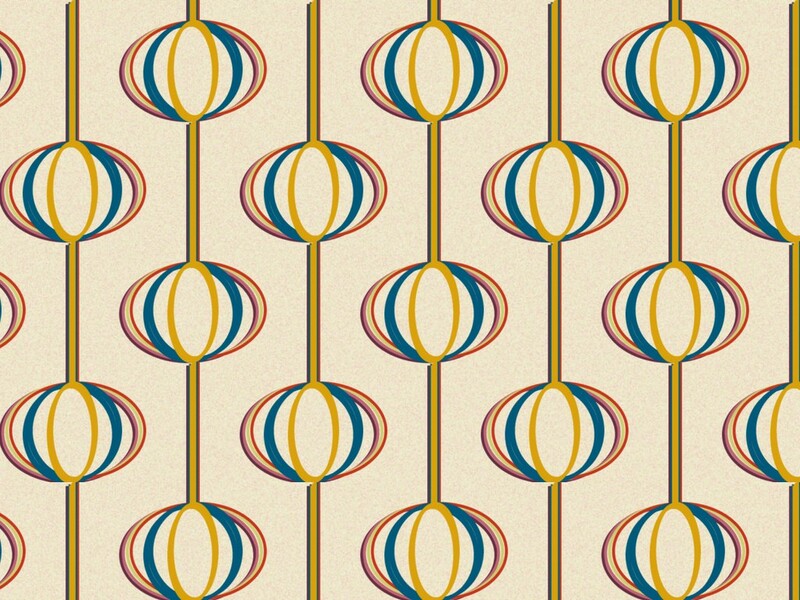 One of the central ideas of the 1950s was to represent the new technology that was being discovered and this wall covering uses the concept of atoms. Atomic physics was developing and images of atoms regularly appeared in the press. The mood at the time was to use whatever was new and exciting in design and so many variations of this type of design were produced on everything from textile, wallpaper to tea sets. 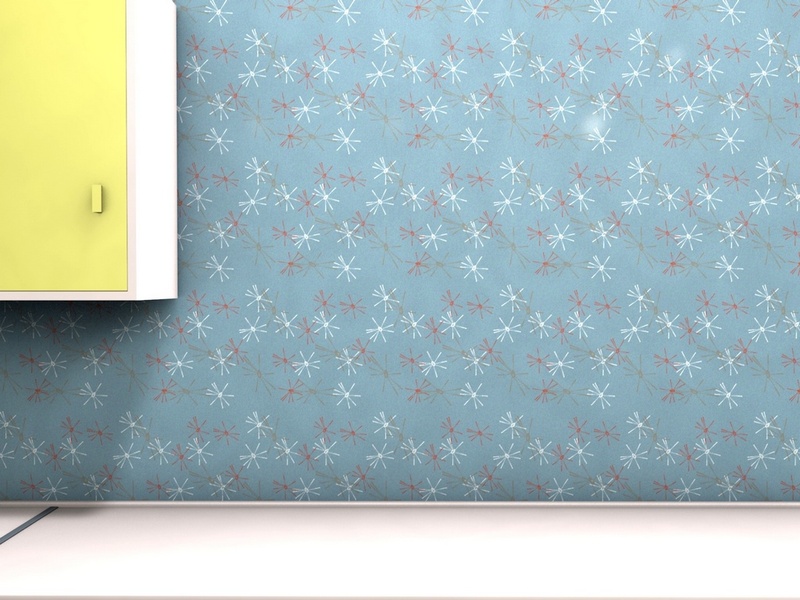 This design is shown as would perhaps have been a washable wallpaper in a kitchen. The paper would have been intended for either a kitchen or bathroom and would have been produced in a variety of smart colours. 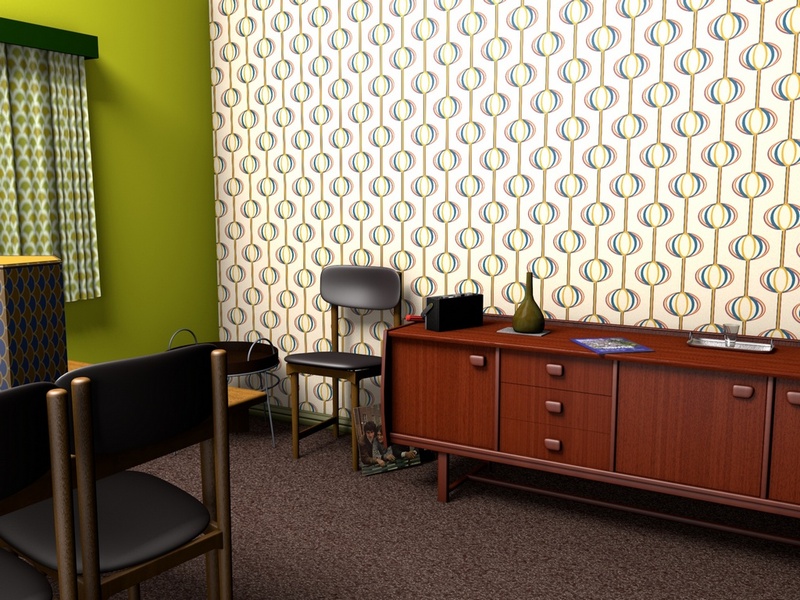 Washable wallpapers using vinyl were new and exciting innovations and, of course, attracted the most modern designs! 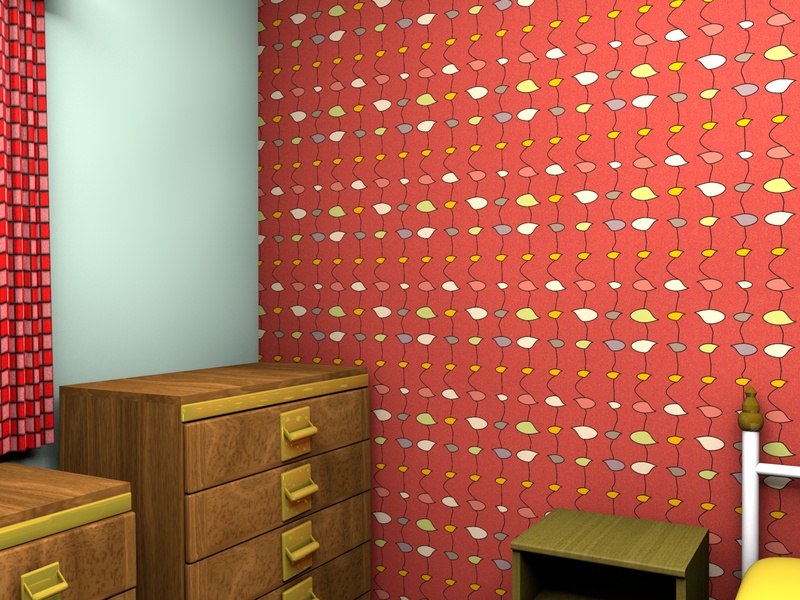 This is a mid-century wall covering that, to be honest, is best described as being perhaps colourful yet cheap and cheerful. Such wall coverings were the mainstay of the industry and provided a lot of people with a wallpaper that fulfilled their needs by being the right colour for their room as well as being affordable, to use a modern expression, and yet was also modern in it’s appearance. 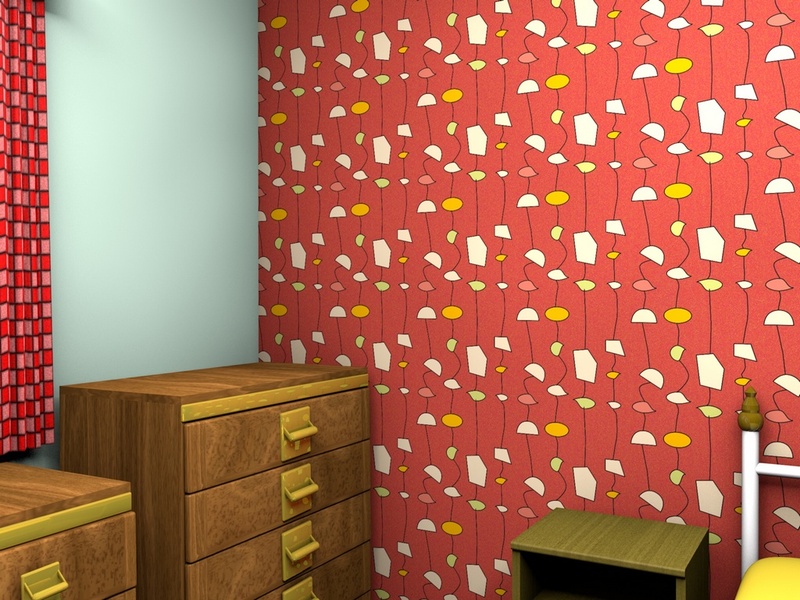 Shown here as a bedroom wallpaper it is certainly not eye-catching yet it does give the room a colourful and warm glow and it looks bright and, well, yes, cheerful. If this had been produced in the 1960s, it would probably have been a successful design because it fulfils that necessary and important domestic role. As promised, here is the second version which sticks more closely to the sort of pattern you would have found in the UK in the 1950s. This time I have tried to make the pattern stick closer to the ideals of the original although, I have to say, I am no 1950s artist, I am sure that the designers of the time would have done a much better job. However, this does give more of an original flavour and, straight away, modern tastes will find it less desirable, I believe. I have used the same sets and tried to use the same parameters so that this is a true comparison between what you would have found then and the way that the design might be interpreted today. Which do I prefer? Interesting question for I am torn between my love of mid-century designs and the fact that the more modern design is perhaps the one that I would choose to put on my wall or curtains. Interesting exercise, as they say! A double helping today of 1950s inspired design which is shown, as you can see, on both the walls as wallpaper and on the curtains. 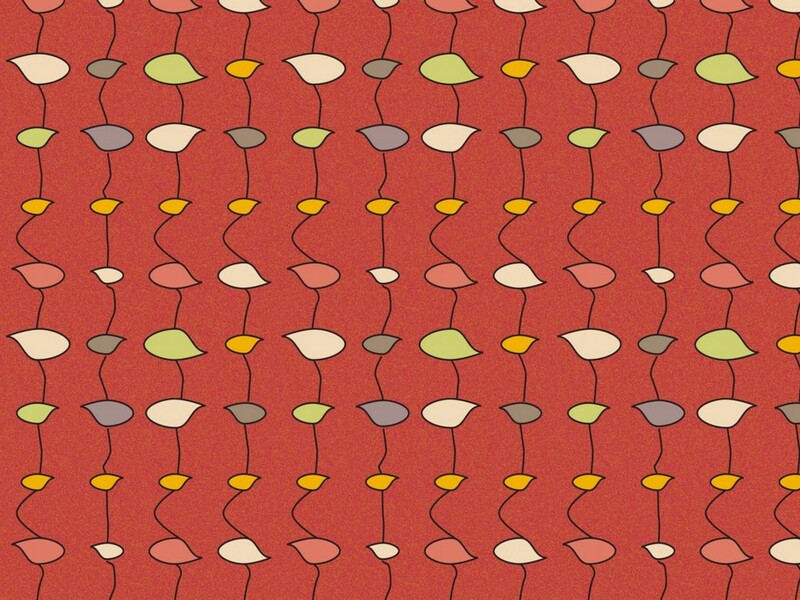 This pattern is inspired by 1950s designs but, and this is important, it is probably not the sort of pattern you would have seen at the time. I have tried to make the pattern more acceptable to modern eyes by keeping it a lot more regular and structured than the designs of the period. That is, I have tried to take the best out of the design while preserving modern thinking and ideas. 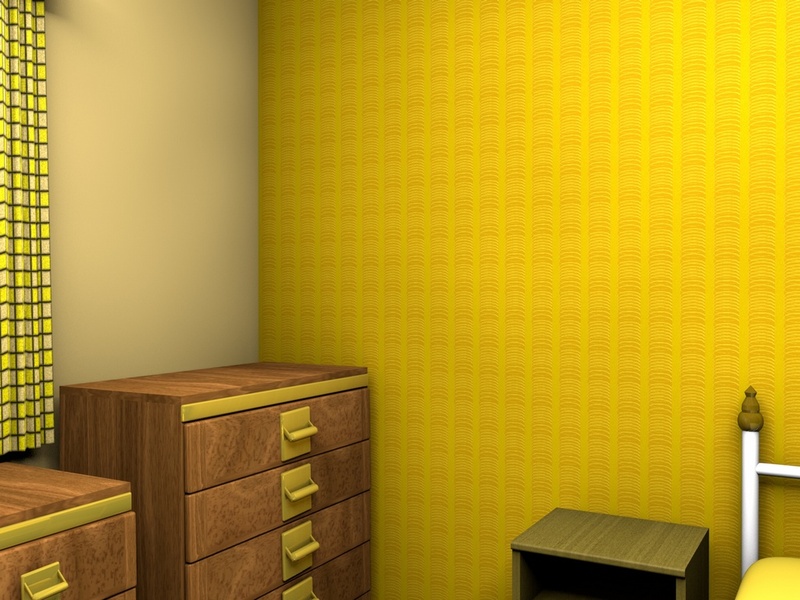 The result, I hope you will agree, is a very pleasant pattern that works well as both wallpaper in the bedroom and as a curtaining material. The 1950s pattern would have been much less ordered and to try to show the difference I am working on a variation of this design that follows 1950s thinking much more carefully and I will use this as both a wall covering and as curtaining and you can judge for yourself. Hopefully I will be able to post this later today. 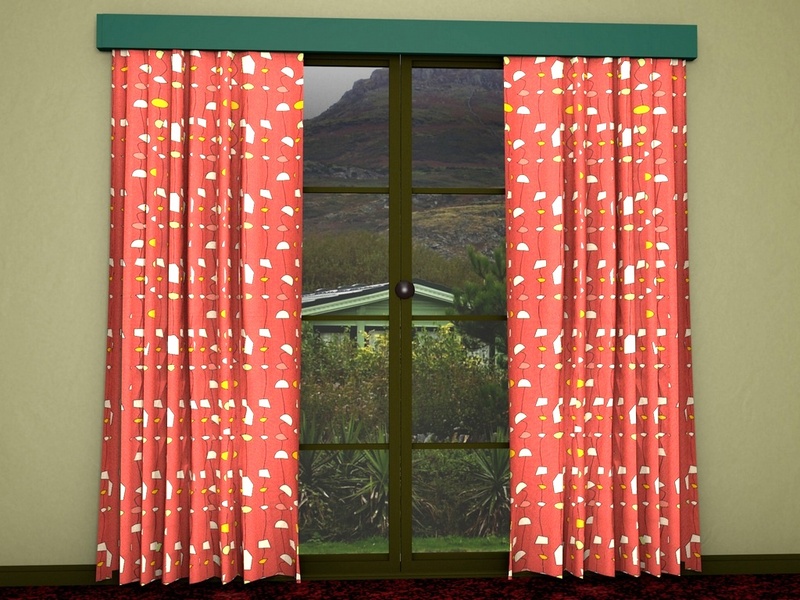 This was assembled in Cinema 4D using my bedroom set and my living room curtain set while the design was constructed in Adobe Illustrator. As promised, here is a development of the same pattern in the same room but this time even more 1960’s orientated. The pattern has been expanded and there is a fresh colour on the adjoining wall to create a warm room that looks just that little bit more vibrant. Patterns from the period would have you believe that even more extravagant designs proliferated but this may not in reality be the case. Many of those patterns were made as demonstration or show pieces and the vast majority of people went for middle-of-the-road designs such as this one. Now that it is complete and finished, I have to say that I like the look of this room and feel that it is a room that I could happily live in if I could go back to the 1960s (which I can’t). 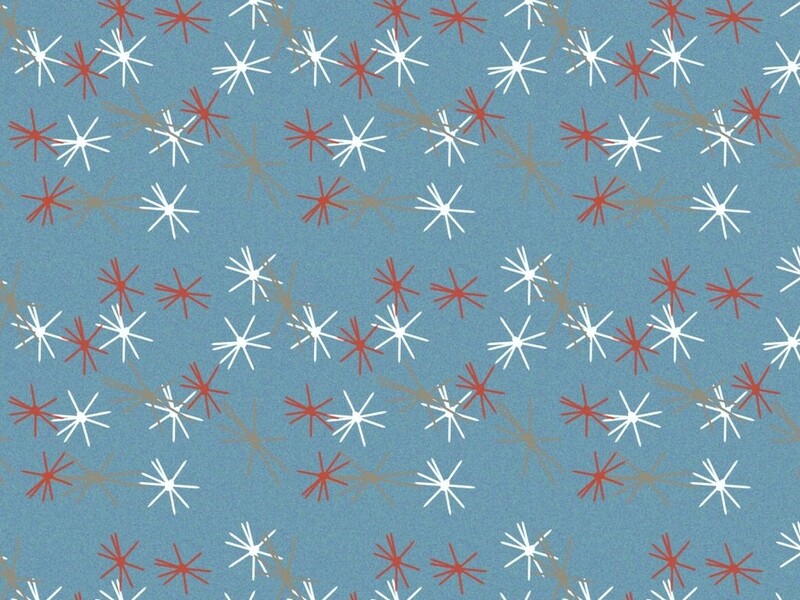 I have to be honest and say that this pattern has been, and still very much is, a personal favourite of mine and so I make no excuses for showing you two versions of it. 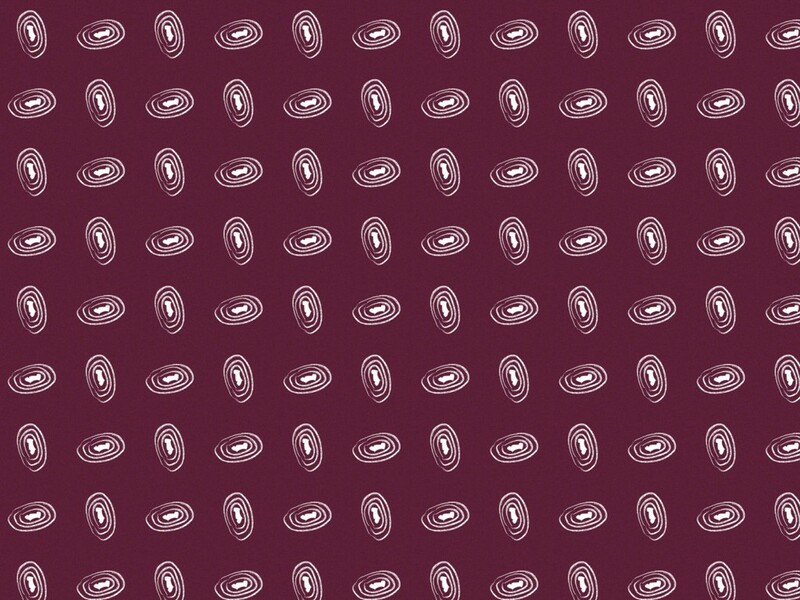 It is a pattern design that appeared in the 1960’s and owes much to the thinking and design ethos of that period. 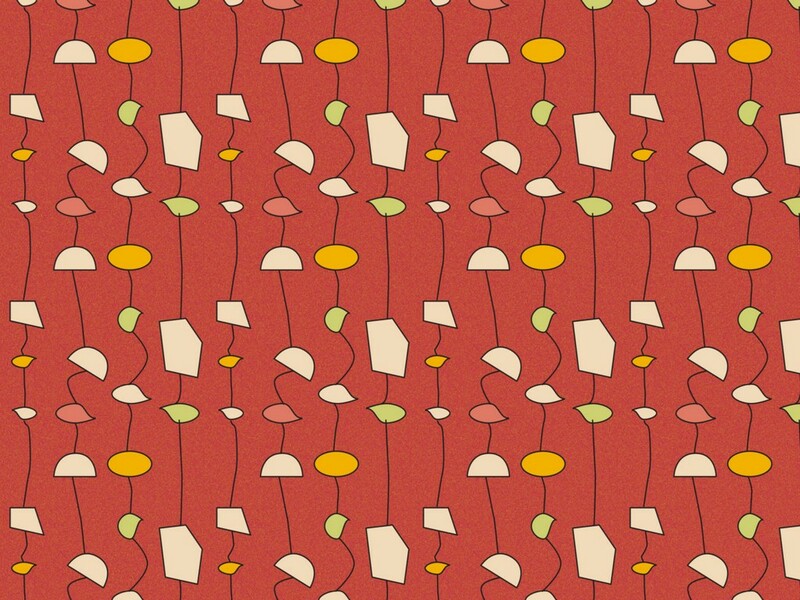 This version is the more subdued (and warmer) version of the surface pattern and is shown in my 1960’s living room set. Here it looks quite tame and could almost (apart from the furnishings in the room) be from a modern set. To show how versatile it is, I will show a very different version next.